"The bodies of the 27 people -- most of them children between the ages of six and seven -- killed by Adam Lanza on Friday, December 14, had yet to be returned to their families when the right-wing noise machine went into gear, blaming public education and a purported dearth of firearms for the tragedy. "Yet, even as right-wing pundits continued to name gun control as a reason that the killer took so many lives, producers at NBC's Meet the Press were unable to get a single pro-gun senator to appear on the show the Sunday after the tragedy. All 31 gun-loving senators who will have seats in the new Congress were invited,according to executive producer Betsy Fischer Martin. "1. Ann Coulter: Everybody should carry a concealed firearm. "2. Mike Huckabee: Massacre the result of church-state separation. "3. Bryan Fischer: God let massacre happen in public school because he's not wanted there. "4. Steve Deace: Killings caused by widespread child-murder by parents and a school assignment in France. "5. Glenn Beck: Killings caused by soul problems. "6. Larry Pratt: Making schools gun-free zones caused the problem. "7. Louie Gohmert: If only Sandy Hook principal had an assault rifle, everyone would have been saved. "For those of you unfamiliar with Conservative rhetoric even under the harsh light of logic and fact, or for those of a stronger stomach than most, here's the link for further details on the Conservative positions on gun control --> http://www.alternet.org/tea-party-and-right/7-unhinged-right-wing-responses-connecticut-massacre?paging=off. "The Brady Campaign to Prevent Gun Violence has a 62-page list of mass shootings in America since 2005. It is Wayne LaPierre's resume. "For the past 21 years, LaPierre has been the National Rifle Association's executive Vice President and chief political strategist. "The long list of killings is due in large measure to the political influence of the NRA—and the campaign finance system that allows the gun lobby to exercise so much power. But an outraged and mobilized public can beat the NRA's clout and pressure Congress to put strong limits on gun sales. "The blood of the 27 victims of the Connecticut shooting, including 20 young children, is on LaPierre's hands. Of course, LaPierre didn't pull the trigger, but he's the NRA's hit man when it comes to intimidating elected officials to oppose any kind of gun control and the nation's most vocal advocate of gun owner rights. "There should be special place in hell reserved for LaPierre. He likes to fulminate about gun owners' rights. But so far he's has been silent on the nation's most recent gun massacre. "The NRA not only lobbies on behalf of "stand your ground" laws, but also offers insurance to members to pay for the legal costs of shooting people in "self-defense." 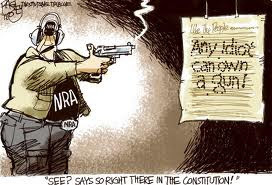 The NRA also defends the right of Americans to carry concealed weapons, including handguns. "According to the Centers for Disease Control, in 2011 there were 15,953 murders in the United States and 11,101 (30 a day) were caused by firearms. Suicides and unintentional shootings account for another 20,000 deaths by guns each year. Of course, many more people are injured—some seriously and permanently—by gun violence. 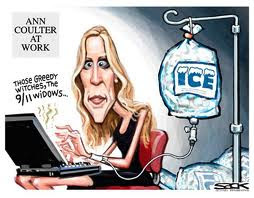 "The shooting in the Connecticut school was not an isolated incident. We've almost become used to a regular diet of gun-toting rampages. The most visible of them—like Columbine, the Virginia Tech killings, the murders in the Aurora, Colorado movie theater, and the Arizona shooting that nearly claimed the life of former Rep. Gabrielle Giffords and left six others dead—stick in our minds, but there are many others. Even more Americans are killed each year in one-on-one shootings. "Until we tame the power of the NRA, we can expect more killings like this. "It is no accident that the United States ranks first in the world—by a wide margin—in gun-related civilian deaths and injuries. Compared with every other democracy, we have the most guns per capita and the weakest gun laws. But the danger isn't simply the number of guns; it is the type of guns we allow people to legally purchase. Other countries permit hunting rifles. But many Americans believe it is their right to own an assault weapon. 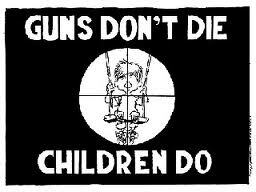 "Even in countries with strong gun-control laws, some people will get their hands on a weapon and destroy others' lives. The tragic killing in Norway last year is testament to this reality. (Although let's recall that Anders Breivik bought $550 worth of 30-round ammunition clips from an American gun supplier for the rifle he used to kill 69 Norwegian kids at a summer camp. Thanks to American laws, it was a legal online purchase.) 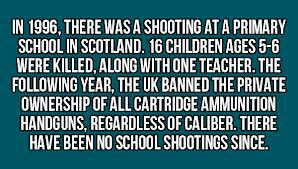 But the shooting in Norway was an infrequent occurrence; it is, in fact, one of the safest countries in the world. In contrast, the U.S. is off the charts in terms of murder rates. "In other well-off democratic countries, gun violence is rare and shocking. According to the recent comparative figures, the US had five murders for every 100,000 inhabitants. Finland was next with only 2.3 murders per 100,000 residents, followed by Canada (1.8), Belgium (1.7), France (1.3), England and Australia (both 1.2), Netherlands (1.1), Sweden (1.0), Germany (0.8), Norway (0.6) and Japan and Austria (both 0.5). In other words, America's murder rate is more than eight times greater than Norway's. "Here's where the NRA comes in. According to the Center for Responsive Politics, since 1990, the gun rights lobby, led by the NRA, has contributed $29.2 million to candidates for Congress and the White House, 87% of it to Republicans. In the most recent election cycle, gun rights groups donated $3.1 million to political candidates and spent another $5.5 million in lobbying. "In contrast, since 1990 gun control groups have donated only $1.9 million to politicians, 94% to Democrats. In the most recent election cycle, these groups contributed only $4,000 to candidates and spent only $420,00 on lobbying. "LaPierre added: 'All that first term, lip service to gun owners is just part of a massive Obama conspiracy to deceive voters and hide his true intentions to destroy the Second Amendment during his second term.' He also warned that everything that 'gun owners across America have fought to achieve over the past three decades could be lost' if Obama won a second term. "If Obama does take this kind of leadership, he will have the backing of an overwhelming proportion of Americans who support stricter guns laws. 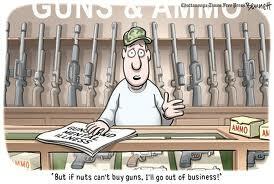 For example, 82% of Americans support limiting the sales of military-style assault weapons. Also, 87% of Americans support background checks on private sales of guns, including sales at gun shows. And 79% support requiring a police permit before the purchase of a gun. A majority of Americans oppose the NRA's top federal legislative priority—national reciprocity for concealed carry permits—which would allow people to enter any state with a concealed, loaded gun even if they fail to meet local permitting requirements. Not surprising, almost all (94%) police chiefs favor requiring criminal background checks for all handgun sales. "Although the NRA likes to portray itself as representing grassroots gun owners, the bulk of its money comes from gun manufacturers. LaPierre does not speak for America's gun owners. He is a corporate lobbyist. In fact, a majority of gun owners support stricter gun laws. "Every American grieves for the families and friends of the people killed and injured in the Connecticut shooting. But until we tame the power of the NRA, we can expect more killings like this, as well as the deadly daily diet of murders throughout America committed by angry and in some cases crazy gun-toting people whose 'freedom' to own weapons of mass destruction LaPierre defends." "...the reality is that the United States had begun grappling with its epidemic of gun violence in the 1970s by passing commonsense gun laws, and it was Reagan and Bush-41 who saw the political advantage in playing the tough-guy role and treating gun-control advocates as sissies. "Looking back on the past three decades, it should be obvious that Reagan was profoundly and tragically wrong. 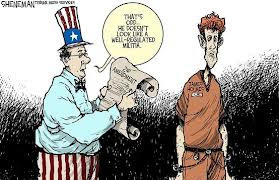 Many of the most notorious mass slaughters of recent years were inflicted by 'law-abiding citizens,' that is people with little or no criminal records but with unchecked mental disorders. "Their easy access to high-powered and semi-automatic weapons allowed them to murder large numbers of people before they could be stopped. 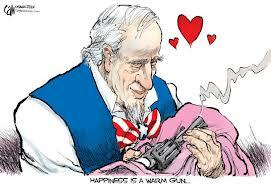 To suggest that the NRA has somehow helped 'secure … our domestic tranquility' is a sick joke. "But Reagan surely benefited from the staunch support of the NRA and gun owners when he swept to a landslide reelection in 1984. Those results were duly noted by Reagan’s Vice President George H.W. Bush who made opposition to gun control an important part of his 1988 campaign. "With Bush’s landslide victory in 1988 – and with the well-meaning Dukakis dismissed as a hopeless 'loser' – the path was cleared for the NRA to rollback even modest gun-control laws, such as restrictions on assault rifles. "In 2010 on a 5-4 vote, right-wing justices on the U.S. Supreme Court – placed there by Reagan, Bush-41 and George W. Bush – overturned longstanding legal precedents that deemed 'the right to bear arms' a collective right and transformed it instead into an individual right. That meant even local gun-control ordinances could be struck down. "In other words, Republicans – and particularly Ronald Reagan and George H.W. Bush – hold primary responsibility for the kinds of horrors that have claimed innocent lives in places like Newtown, Aurora, Tucson, Columbine, Virginia Tech and so many other locations whose names will long be associated with butchery. "While Kristof and fellow mainstream pundits may be right in noting that it’s time for all politicians to stand up to the NRA, they are wrong in spreading the blame equally. They should have the courage to tell the truth, that Reagan, Bush-41 and other Republicans have led the way into this national madness." Not since the massacre at Columbine has an event like the Connecticut shooting brought the gun problem to the attention of citizens and parents. The phony rationale of the Second Amendment is weakening as only the shooting of twenty seven innocents could, and sooner or later people will understand what Thom Hartmann and others have been explaining for years: that the Second Amendment is the only "conditional amendment" in the Constitution, that the ability to keep arms is a result of a prior condition, i.e., that "A well regulated militia being necessary to the security of a free state, the right of the people to keep and bear arms shall not be infringed." 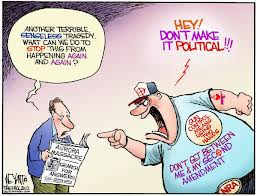 When you understand this conditional amendment, hearkening back to the original model of our National Guard - the militia - together with the profit motive behind the NRA, the Second Amendment gives does not give all Americans the right to possess guns of any kind—not just hunting rifles but machine guns and semi-automatics pistols and rifles. Tomorrow: The Constitution And How To Cure America's Gun Addiction. on like a hundred pounds."